I've been wanting a change to SP Game-Used for a while now... and Upper Deck has done it! This year's product is dramatically different than what they have done in the past. 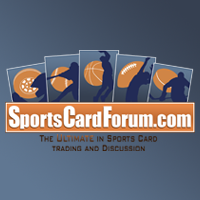 SPGU has been aging, and people have been getting more and more tired of the same old expensive, seemingly overpriced card set. This is a new beginning that will hopefully revive the brand! Is there really a base card in SPGU this year? Well, sort of. SPGU comes pretty much with all 'hits'. I would call the standard jersey card the base card of the set. There are a few cards with no memorabilia or autograph on them, but they are some of the most limited in the set. Those cards have serial numbering to the player's jersey number be it rookie or veteran player. I actually think it's a neat idea to have the standard card in SPGU to be a jersey card. They have become so commonly place that many jersey cards are pretty much priced the same as a jersey anyways. In terms of design, the standard jersey card in SPGU has an elegant design that doesn't distract. I think some would like it for its simplicity, but I feel these cards could have stood out more. 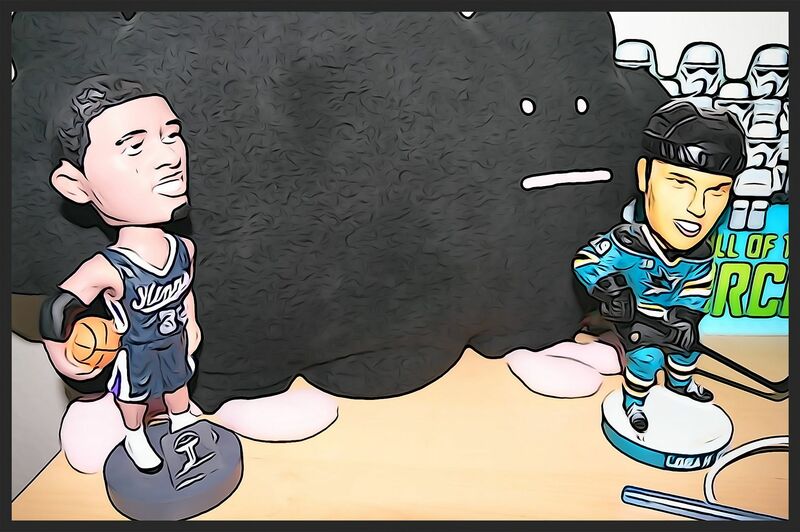 As a part of the SP line-up of Upper Deck cards, they fit right in. The back of the cards have the standard numbering of a base card, but instead of stats, it has the 'congratulations' blurb about getting a hit. I didn't receive a non-memorabilia hit in my box, so I'm not sure what those cards are like. My guess is that they would have standard stats on the back. And those would be the 'true base cards', but since they are so limited, I would count those more as special insert cards. Those would certainly be very difficult to make a set of. 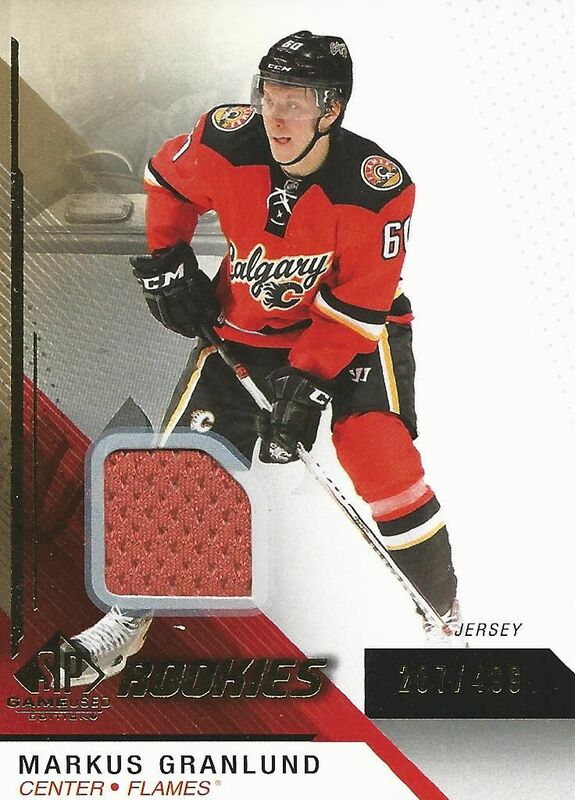 The rookie jersey cards have serial numbering and a different, but similar design to the standard jersey cards. I can't say much about these cards as they don't particularly stand out to me - much like the base cards. It's a typical Upper Deck SP design that I will probably forget in a few years. 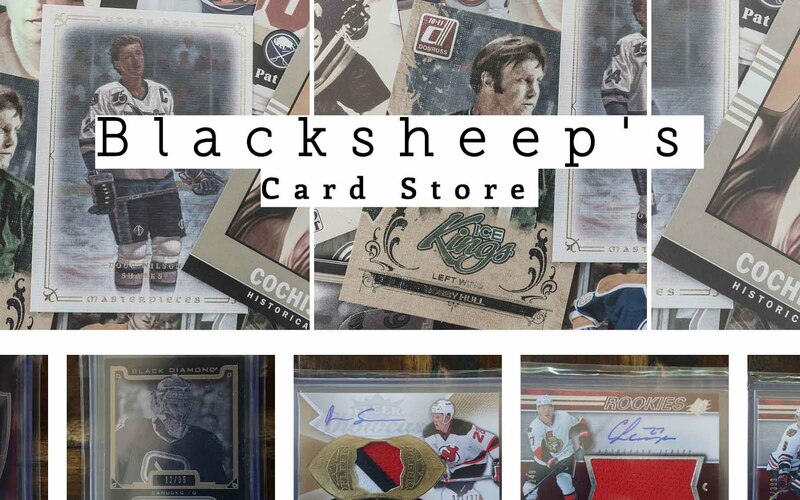 Just about every card collectors find in SPGU this year will be a hit. Upper Deck has gotten rid of regular base cards and even the pack concept pretty much. SPGU is much more like Ultimate Collection or The Cup now. Here's a patch variation of the base card. This particular one of Cory Schneider is limited to just 99. It shares the same exact design as the base cards except that these carry patches and are quite a bit thicker. 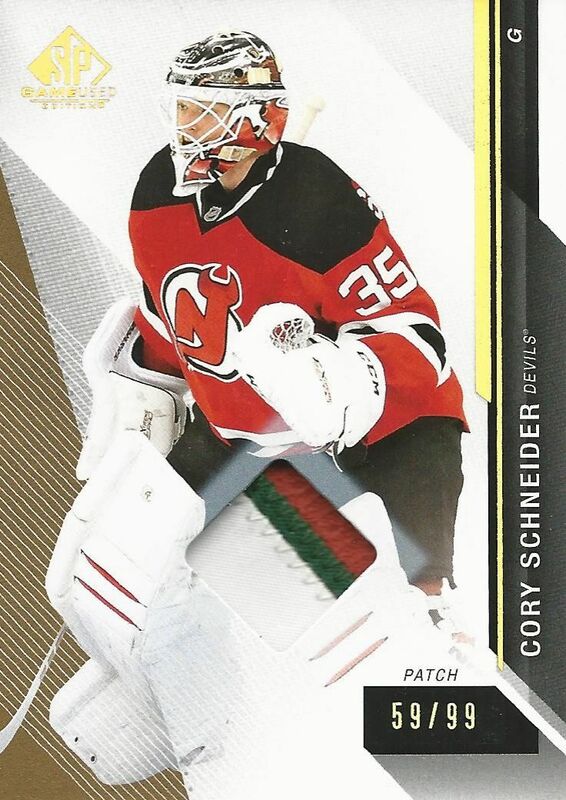 99 seems like a high number for patch cards, so I'm guessing that these cards should be in very reasonable price ranges as they hit the secondary market. Draft Day Marks are back in SPGU. These are fun cards, but I've always questioned why these are even in the brand. With a name like 'Game-Used' I would expect material that was used in a game. These manufactured patches were obviously not in any way, shape, or form associated with an actual hockey game. In fact, these cards are all about draft day... not game day. That being said, these cards do add value to the set as people love getting more autographed rookie content. SPGU has a ton of variety in it. Not only are there patches, but collectors will find sticks as well as game used nets. Upper Deck has included quite a few game-used pieces from the Winter Classic and Stadium Series of games that were played last season. It was really hard to recommend SPGU in the past. Buying 5 or 6 packs at nearly $200 was just not worth it... especially since the majority of packs contained plain jersey cards. This year the price is almost halved with about the same content. That is something I could live with. I like the fact that Upper Deck has changed the brand. Having no regular base cards was a great idea. SPGU is now much more condensed and much more of an interesting product. There's just no fluff! Well... I guess some of the standard jerseys are fluff... but you know what I mean! I have to say that Upper Deck has moved correctly with SPGU and I look forward to its continued improvement and refinement. Nice box. I like the irony in the Draft Day Marks nice catch. 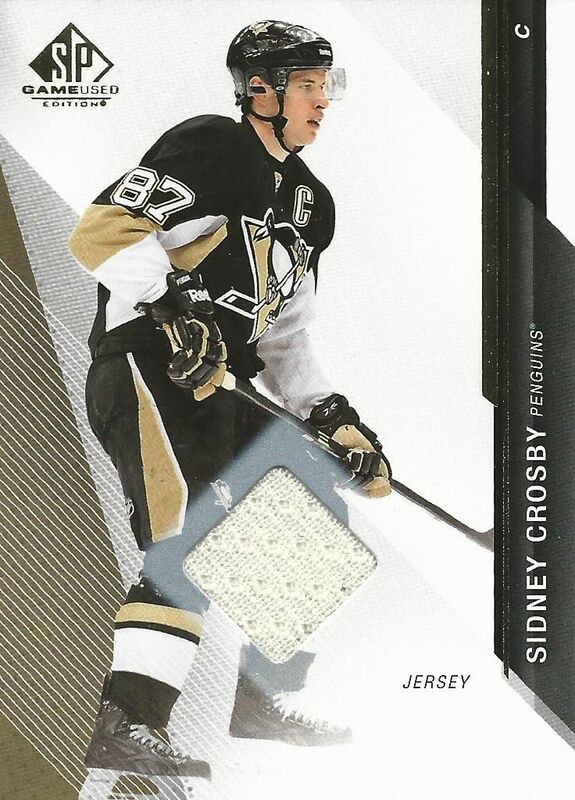 Nice Sidney Crosby jersey card! It's pretty cool, it seems like they are replacing Limited or some other 1 pack per box product from Panini. Great box thanks for the review! Sick Crosby jersey card! Awesome break like always! + It's good to se that UD finally are changing some of their old brands. +Some of the cards look pretty good, and I like that you can get mem/auto cards of the new rookie class. - The swatch on the common cards seems misplaced to me. That's something that they could've done better. - Same procedure as every year... In a product called SP Game Used almost all content should be game used in some way. I thought they should've at least changed the design of the Draft Day Marks. Were they just lazy? Also in Black Diamond 14-15, the photo of Gretzky's quad diamond card is exactly the same as in 13-14 Black Diamond. UD could have used a different photo for crying out loud. I'm starting to miss Panini already. SP Game used was a decent break, not really worth the price and the auto's on the manufactured patches never like how they looked. + ditching the base cards and focusing on the hits at a cheaper price was a genius move. I bought a box of 11/12 SPGU during Black Friday and still felt cheated. 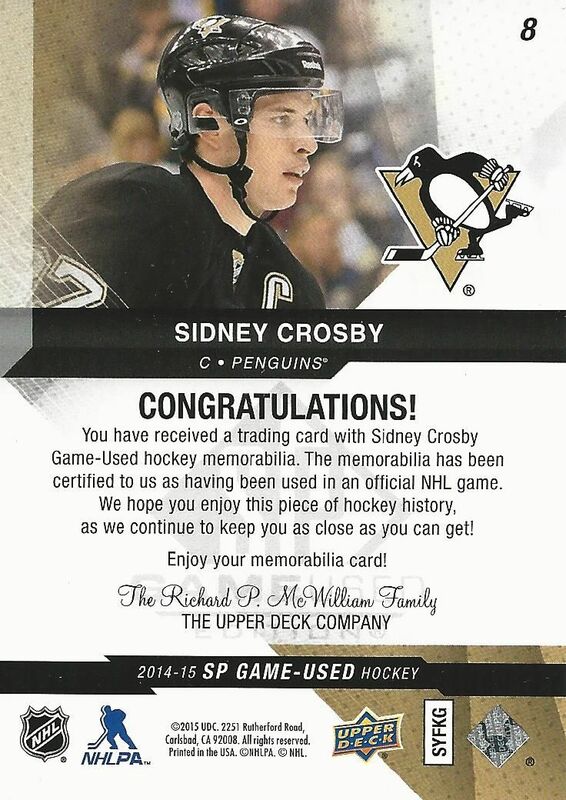 Nice Ekblad and Crosby, though i dont like that u still get sticker autos on the card! But an Crosby,Ekblad and a nice patch! Good box! Loving these vids dude. Keep it up! 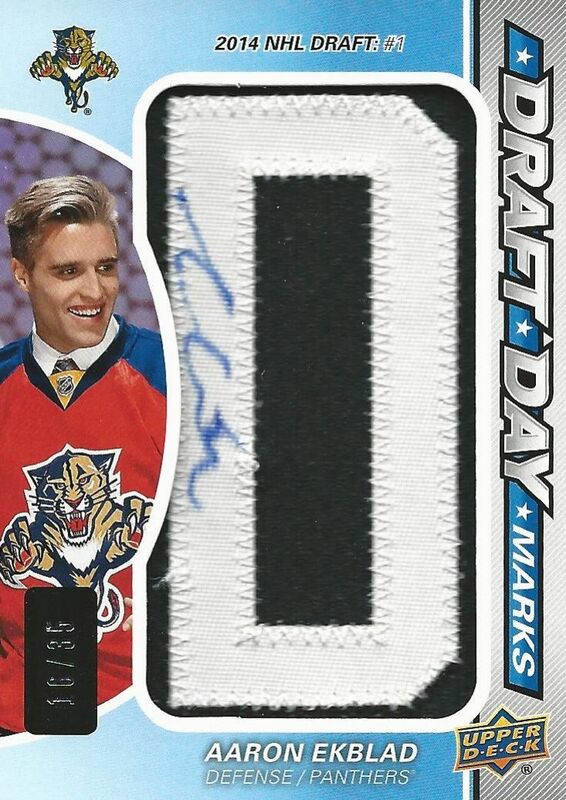 That Ekblad card is so sweet although I do agree with the whole Game Used thing. Seems like an odd inclusion for SPGU. Great product, as always ! nice!! add me in contest plz!! Great box break sweet patch. With that Ekblad, you got your money back! Sad that most of these jerseys won't be worth a lot though. NIce box overall. Really like the overhaul on product configuration and the fact that the base set has become even more premium. Nice review, I tottaly like this year sp. Damn that Ekblad is nice! Nice box and review! I do agree on your point of how SP should incorporate more actually game used material into the product.